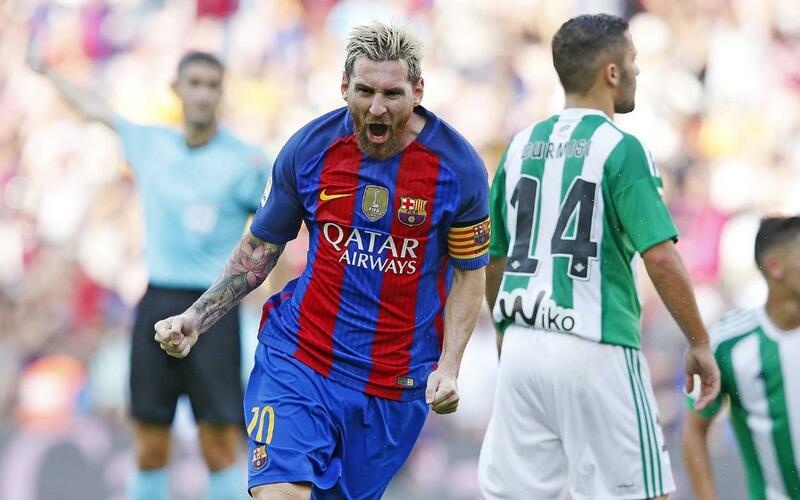 FC Barcelona’s defense of their league title began with a 6-2 win over Real Betis on Saturday evening with a goal from Arda Turan, two for Leo Messi and a Luis Suárez hat-trick. It may be a new season, but it was the same free-flowing attacking football on display at the Camp Nou that the home faithful have come to expect, as Barça cruised to a comfortable win to open the league campaign. If there were any nerves ahead of kick-off, they quickly subsided when Jordi Alba brought down Messi’s cross, before picking out Arda, who then prodded home to make it 1-0 after just six minutes. It was the Turkish international’s third goal in four days after his midweek brace against Sevilla in the Spanish Super Cup. But just as the home side looked to be getting into their rhythm, Betis responded with a goal out of nowhere. Betis’ top scorer from last season, Ruben Castro, fired a free-kick from the edge of the box, and although Claudio Bravo managed to get a hand to it, the venom of the shot took it beyond the keeper and into the top corner for 1-1, ending Barça’s run of almost 13 hours of competitive football without conceding. Messi’s threaded passes in and around the area caused havoc to the Betis defence all game long, and his through ball to Suarez on 26 minutes resulted in the Uruguayan being pushed to the ground but no penalty was awarded. The decision seemed to spring Barça into life as, in the very next attack, Messi struck the frame of the bar. Soon enough, the Catalans were back ahead, and this time, the no.10 would not be denied. In typical Messi fashion, the Argentine shifted the ball onto his magic left-foot and released an unstoppable effort from around 25 yards into the corner of the net. And on the stroke of half time, Barça gave themselves a two-goal advantage – just as Alba did for the opener, Sergi Roberto on the opposite flank showed presence of mind to pause before picking out Suárez who, with a first-time take, buried the ball into the far corner to make it 3-1. Despite the two-goal cushion, Barça emerged for the second half in no mood to let the match simply fade out, as a flurry of attempts rained in on Antonio Adan’s goal. A Messi strike from the edge of the box looked to be squirming into the corner after the keeper’s save but Arda’s touch ruled the goal out for offside. Rakitic’s left-footed swing then went just wide of the post before an acrobatic Denis Suárez attempt was comfortably saved by Adan. Betis did manage to venture forward on 56 minutes, but it came at a price, as the visitors’ broken-down corner led to a swift Barça counter-attack. A fine combination between Arda, Messi and Luis Suárez culminated in the latter tapping in from close range to make it 4-1. No sooner than the Barça faithful had sat down from celebrating, they were up again as another powerful Messi strike from the edge of the box past a helpless Adan. Luis Suárez was the league’s top scorer last season with a whopping 40 goals, and the Uruguayan looked intent on sending a clear message to opposition defences for the campaign ahead. The no.9 sealed his hat-trick with a beautifully whipped free-kick for 6-1. There was still time for Betis to grab a consolation, as the ball fell kindly to Ruben Castro whose strike found the bottom corner for his second of the game. It was a near perfect start for Luis Enrique’s side to kick off the new season in front of their own supporters. The match also saw league debuts for Samuel Umtiti and Denis Suárez who started the game, as well as Lucas Digne who came on in the second half for Alba. Barça’s next challenge is a tricky trip to Bilbao to take on Athletic Club in Week 2 of La Liga on Sunday 28 August.